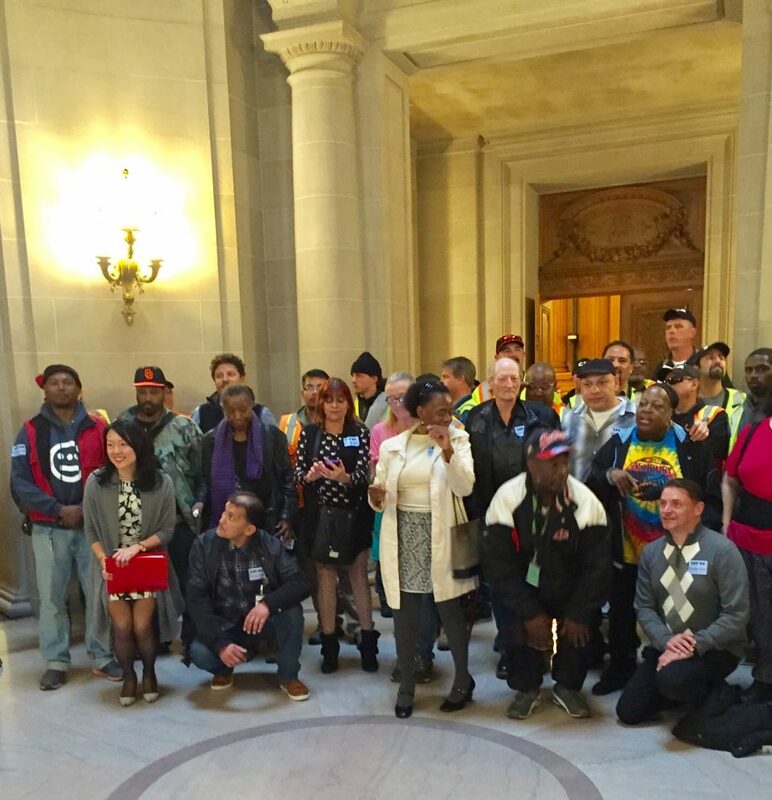 The San Francisco Board of Supervisors Land Use Committee voted 3-0 today to approve a Tenderloin affordable housing project backed by tenants, labor, D6 Supervisor Jane Kim, the developer of the inextricably linked 950-974 Market Street project and just about everyone else in the city. I wrote last week that Mark Farrell opposed the project, but he reversed himself today. .
Over 50 speakers urged the committee to move this vital housing project to the full Board. There were no speakers in opposition. The proposed project at 180 Jones will get housing built on a site that has been entitled but vacant for nearly a decade. It nearly doubles the number of units currently entitle for the site, and includes 34 step-up housing units out of the 68 total. These units enable SRO tenants living in city-funded supportive housing to “step-up” to apartments, freeing up their former units for homeless persons needing a home. Creating these vacancies is akin to saving the city nearly $1 million a year (the full cost of leasing a 34 room hotel). Further, tenants eligible for the step-up units include many who spend their days working to improve the Tenderloin and Sixth Street. This helps explain why the offsite affordable project at 180 Jones has such broad support. Aaron Peskin understands the importance of step-up housing. Because people thought 180 Jones would breeze through committee last week, there were few speakers and he did not get the full picture of 180 Jones. He did today. Peskin played a critical role in moving this project to the full Board. Katy Tang does not have experience with SRO’s but she has proved a very pro-housing supervisor. She is the most pro-housing supervisor from San Francisco’s Westside in recent history, supporting new units not just in the Mission and SOMA but within her district as well. In other words, Farrell wanted Joy Ou to break her agreement with the community and throw Tenderloin residents overboard—which Ou refused to do. Farrell does not understand the Tenderloin, another reason why he had no business interfering with this project. Ou, like Craig Young of Tidewater Capital who is building at 1028 Market and the Shorenstein Company at 1066 Market, see themselves as part of the Tenderloin community. None of these developers want to isolate themselves by betraying the Tenderloin, which is what Farrell was asking Joy Ou to do. The project now moves to the full Board where unanimous approval is expected. D6 Supervisor Jane Kim attended the hearing and strongly backed the tenants’ cause.